Unleash the full potential of all your physical assets. Implement customised maintenance solutions, designed by specialist asset care engineers. At Pragma, we know that every organisation has unique asset management needs and that no single solution will be the best fit for all industries. Based on this understanding and our extensive experience in developing customised asset management strategies, we have developed a holistic suite of services, aimed at improving asset performance while managing costs and risks. Our service offering is based on our asset management road map, plotting a course for organisations to move from a reactive state where breakdowns are tended to as it occurs to a place of total control, where optimal asset availability and uptime become a reality. 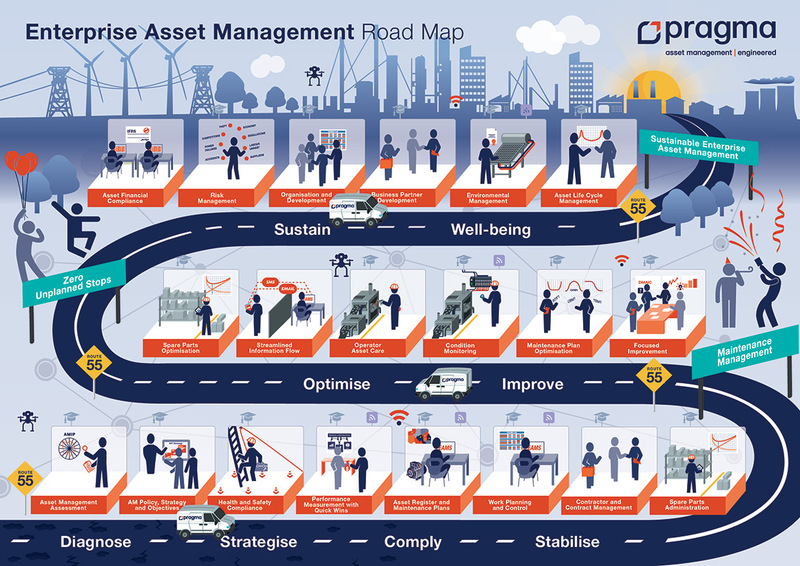 To create this road map for our clients, we undertake an AMIP assessment, an asset management maturity audit designed by our specialist engineers, detailing the current state of your asset management capabilities and shortfalls. This information forms the foundation of a strategy which will help you achieve your desired end state. We use the findings of the assessment to combine the appropriate parts of our tools, assets and experiences to build a product and service offering specific to our client’s needs. This process is supported by service level agreements which are, in turn, informed by an understanding of the roles and responsibilities of both parties in our partnership. To learn more about our assessment and service design processes and how we implement best practice, click on the scenes in our road map.